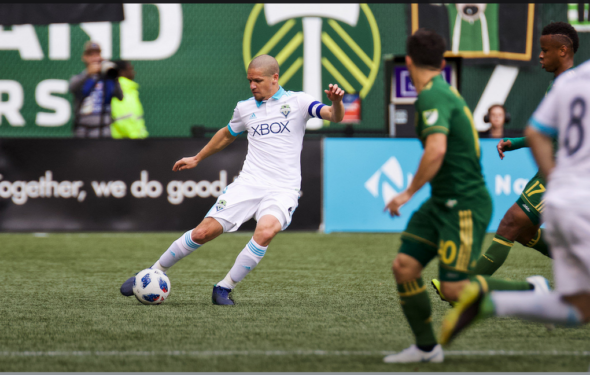 The Sounders scored the valuable road goal first, but the Timbers won the first leg of the playoff match 2-1 and also put a hurt on Marshall, Roldan and Svensson. PORTLAND — The Seattle Sounders knew it would be hard, but perhaps not this hard. Their fates will be crucial in which side emerges from the second leg that begins at 7:30 p.m. Thursday at the Clink. A feisty, explosive first half produced goals, injuries and intrigue in a showcase for the most renowned rivalry in MLS. Sebastian Blanco and Jeremy Ebobisse tallied for the hosts as they roared back from an 1-0 deficit to claim a halftime lead. Raul Ruidiaz opened the scoring 10 minutes into the match. The Timbers squandered their momentum and failed to extend their lead in a second half that fell flat as the sides combined for only three total shots on goal, none of which found the net. Sloppy play and key injuries plagued the visitors, though the result ensures that any shutout victory Thursday would be enough to see the second-seeded Sounders advance. The atmosphere was electric on an overcast Sunday. Hundreds of Sounders fans made the trip south for the club’s first postseason match-up with the Timbers since 2013. Scarves, flags, and banners waved from both ends of the stadium hours before the action. The sights and sounds were familiar for a Cascadian soccer match, but the stakes of the game added an intensity and urgency. It didn’t take long for the drama to begin. Inside of five minutes, Ruidiaz uncharacteristically failed to set his feet properly as he ran onto Nouhou’s low delivery in the middle of the penalty area hardly making contact as the ball rolled past him. Another chance fell to Seattle’s rising star moments later, only for Ruidiaz to poke his near-post effort straight at Timbers goalkeeper Jeff Attinella. It was on the forward’s third chance that Ruidiaz was able to score for the vital away lead in the two-match aggregate format. Midfielder Roldan received a pass down the right channel from Victor Rodriguez and picked out Ruidiaz on the front post. The Peruvian slammed his first touch into the roof of the net from near the edge of the six yard box. The game roared to life. Timbers defensive midfielder Diego Chara exchanged shoves with Sounders playmaker Nicolas Lodeiro at midfield, firing up the home crowd just as the side required an emotional lift. A strong passage of play resulted for the hosts, the decibel level steadily progressing with the move, culminating in rookie Ebobisse’s neat chip past goalkeeper Stefan Frei from the top of the penalty area, leveling the match at 17 minutes. The Timbers, who took two of the three regular-season games, struck again at 29 minutes, punishing Seattle for a cascading series of failures. The collapse began when Roldan was forced to step off to the side of the field for medical attention for a second time, following an early collision with Attinella. Before Seattle could make a substitution, Osvaldo Alonso misjudged his touch at midfield and set the Timbers on the counter. Marshall and Kim Kee Hee went to ground without winning the ball as Diego Valeri ran at the heart of the defense, leaving the visitors completely exposed. A deflection took the ball to Blanco on the left side of the penalty area and the Argentine neatly tucked it away low to the far post to give Portland the lead. Ruidiaz’s opener. Their strong start felt like a distant memory in the din of Providence Park. Roldan subbed off moments after Blanco’s goal. Schmetzer said the injury was a hip flexor. The University of Washington product started all 34 regular season matches in 2018, and his absence threw a wrench into the works for the Seattle coaching staff. With 10 minutes left in the half, the situation went from bad to worse: The Sounders lost MLS Defender of the Year candidate Chad Marshall to a right knee injury. Initial reports indicated that the center back avoided tearing ligaments. Roman Torres replaced Marshall, as a now-disjointed Seattle struggled establish a foothold. A clash of heads between Svensson and David Guzman just before the break marked a third major injury problem. The Swede continued, playing through visible pain the rest of the match. After more than eight minutes of injury stoppages, the Sounders at halftime finally had the chance to wake up from a forty minute-long nightmare that began the moment they scored. Forced substitutions and strange mistakes meant there would be little margin for error. The complexion of the afternoon had turned. Despite coming into the match as the better rested side, it was clear for Seattle that holding off the surging Timbers was the only reasonable aim after the break. The match tossed out another surprise as both sides seemed to leave their intensity in the locker room. Guzman subbed out after five minutes, obviously still feeling the effects of his collision with Svensson. Veteran midfielder Lawrence Olum replaced him. The Timbers had the same discontinuity as Seattle had with the absences of Marshall and Roldan. With Guzman’s departure, the match plodded along. The atmosphere followed suit as the home fans had little to cheer about in pursuit of a third goal. For half an hour the Sounders were allowed to regroup and consolidate their efforts. The match finally came to life again in the last 10 minutes, with both sides fashioning good looks before the final whistle. The crowd lit up for the Timbers’ best opportunity for a blow as Blanco found space down the right side in the last minute of regulation and hit a pinpoint cross to Valeri at the front post. The reigning MLS MVP volleyed the ball towards goal with his first touch but couldn’t keep it under the bar. The air fell out of Providence Park again. At the opposite end of the field, Rodriguez’s tame effort at Attinella from the top of the box marked the last scoring chance of for either club. The result reflected both the hosts’ dominance and Seattle’s scrappy effort to prevent further damage. In the volatile realm of MLS playoff series, momentum changes at an extraordinary pace and teams must capitalize when they have it. From this perspective, the Sounders eked out the perfect second half. The Timbers huffed and puffed but ultimately failed to convert their supremacy into an insurmountable lead. However, injuries may have a much bigger impact on the Sounders’ bid to reach the Western Conference Finals for a third straight season. Steven Agen is the host of the weekly Pacific Northwest soccer podcast Radio Cascadia. Check them out on Twitter at @Radio_Cascadia.